The Indian WTEMCO flywheel/magneto is a Bosch 90mm compatible. Indian has the same engine, controls, switches, and wiring as a Honda PC50. 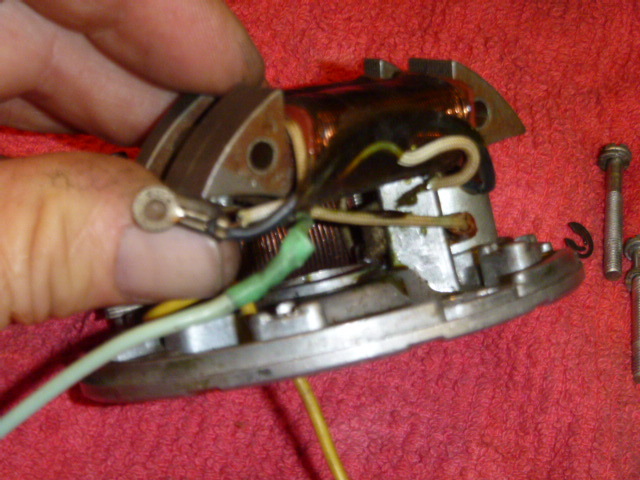 It looks like the light green wire goes to the ignition armature, but there is no connection. 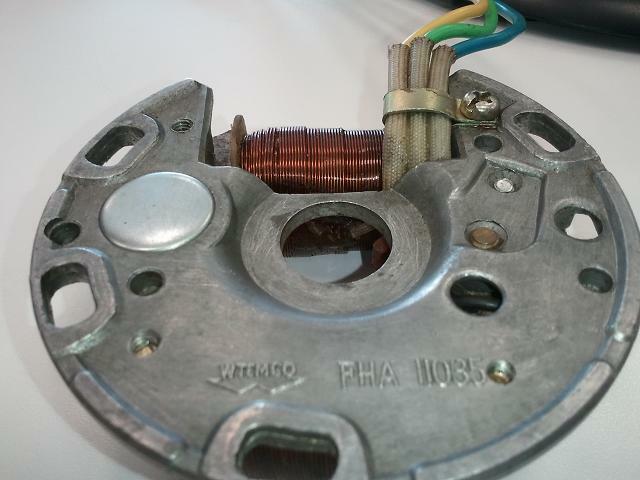 The ignition armature has a support tab for the battery charging coil next to it. 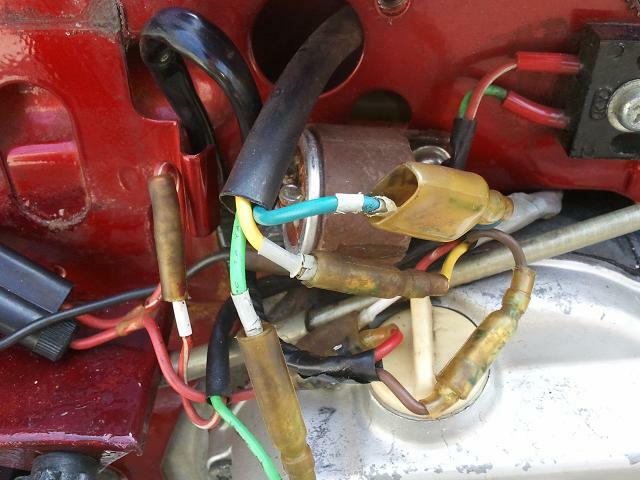 That tab is the black dot in the wiring diagram, where the light green wire originates. 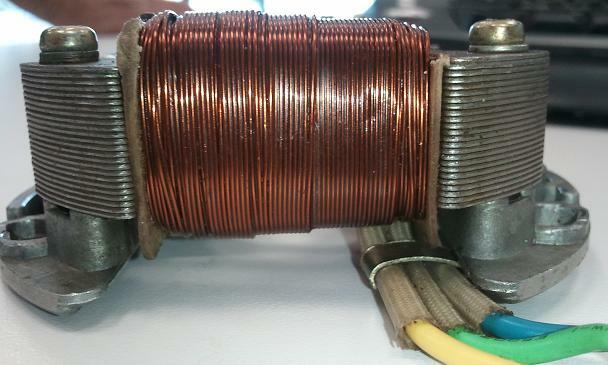 After the lite green and blue cut wires were repaired, the solid copper source coil wire with the white cloth sheath was ready to break off of the blue ignition wire. 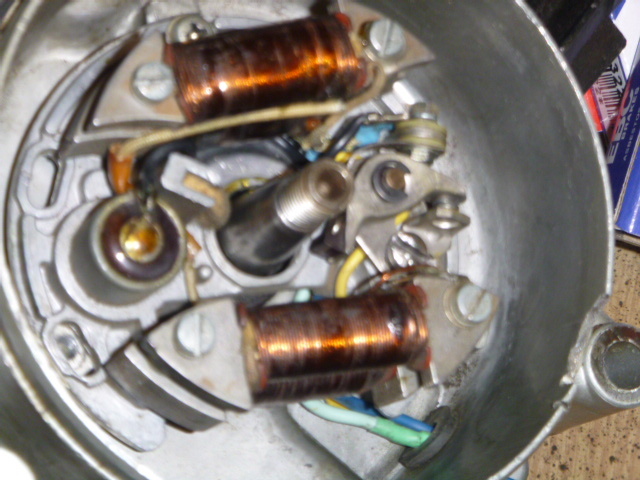 The black condenser wire was partially melted under the source coil, and smashed flat against the stator plate. Here shows the resin that was poured over the coils, after the wires were in position. The excess resin is grinded off. All wires are exposed. Any loose connections are cleaned and re-soldered. Lite green is for battery charging. It goes through both small outer coils, in series. Yellow is (main) lights. Blue is ignition. The 3 branches from the points are 1) blue wire to outside coil, 2) black wire to condenser, 3) white cloth wire to source coil. 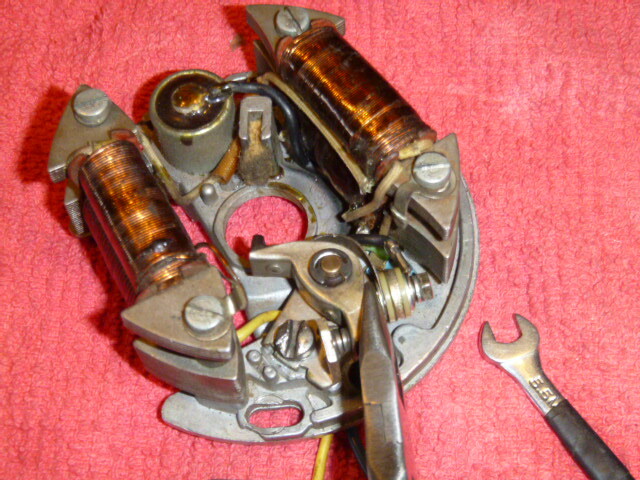 The ignition ground is on the bottom left coil bolt, shown here at top right. The blue wire plus white wire eyelet, and the black wire eyelet go on the points, but cannot touch anything metal nearby. All 3 wires get fatigued where they pass through the hole in the stator plate. Here the points are back on. The light green will go through the hole next, then the lower two coils bolted on after that. Coils are on. Ignition ground is checked, top right (bottom left when installed). Next the loose wires will be tucked in under the coil. Yours first might need rearranging. Don’t let sharp edges rub. Points wire bolt and nut are both 5.5mm hex. Be careful to keep the leaf spring centered while tightening, by holding the bolt solid with the needle nose pliers while tightening the nut. Still oriented upside down. Tested and ready for flywheel installation, after stator screws are in. Testing for spark is done with the essential wires connected. Stationary testing for continuity is done with the essential wires disconnected, as shown below. When each test is performed, the wires are wiggled and prodded to see if the ohms reading changes. Sometimes a conductor will conduct until it is moved a certain way. Sometimes an insulator will insulate until it is moved a certain way. 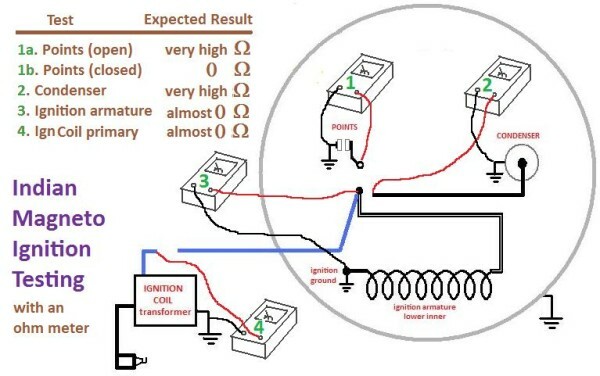 During each test the tester is tested by either disconnecting or connecting the test leads. Most ohmeters do not have a sensitive enough scale to go down below 1 or 2 ohms. Sometimes “testing the tester” by shorting the test leads, shows the slight difference. The Indian WTEMCO flywheel/magneto is a Bosch 90mm compatible. 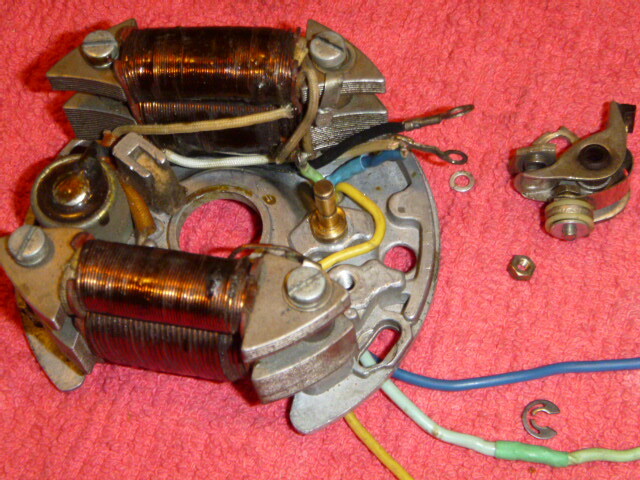 Early Indians had 4-coil, while most have 2-coil. 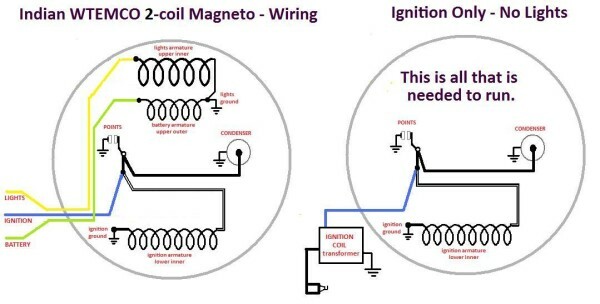 The 2-coil magneto has the ignition coil (45mm bolt spacing) on the bottom and the lighting coil (52mm bolt spacing) on top, like the 4-coil. 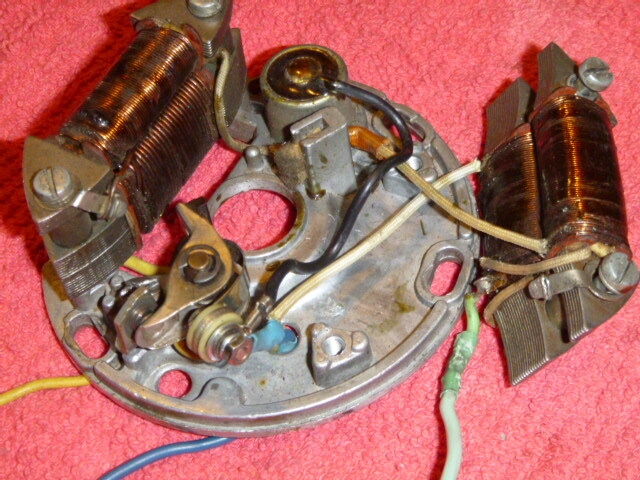 But the two outboard battery charging armatures on the 4-coil have been incorporated into the single lighting coil on the 2-coil. The connections and function is all the same, as is the troubleshooting. 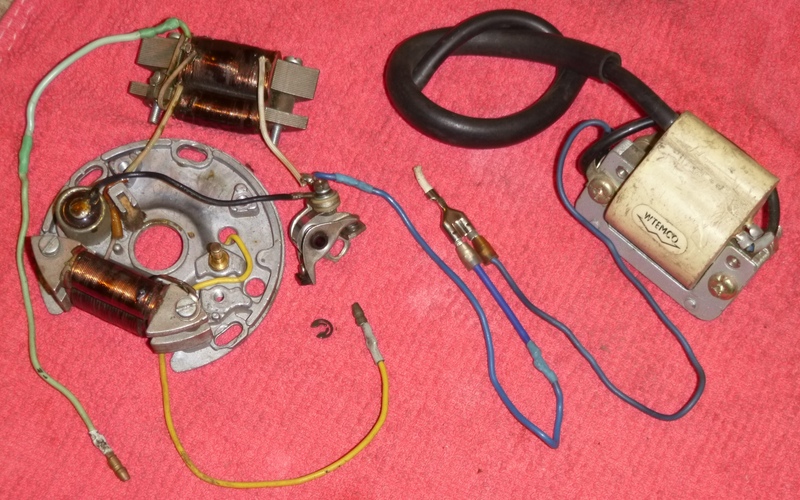 One good thing about Indian magnetos is that both kinds have an internal ignition ground. It is on the lower left armature bolt. On many mopeds it is external, and part of the brake light. Condenser wire passes near top left bolt, so the lights coil doesn’t pinch it. White cloth ignition wire gets soldered to the condenser. Then the blue and white get “tucked in”. Once again, the ignition part of it is the same. 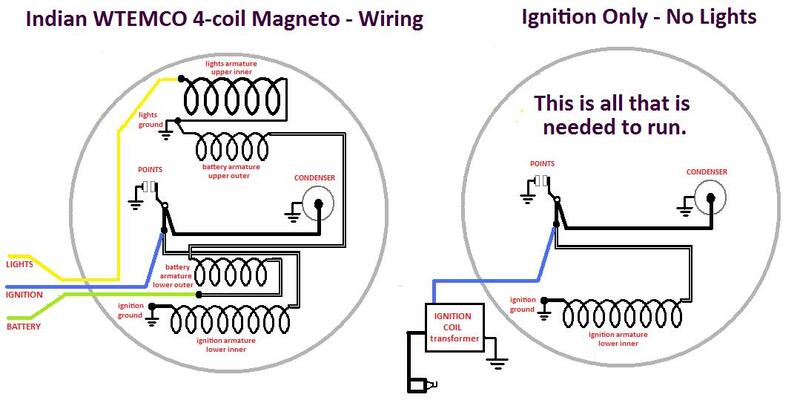 In fact, schematically it’s the same for all points-magneto ignitions. Imagine a fork with 3 prongs: one prong is points, one prong is condenser, one prong is source coil (armature). The three prongs join together as one, the handle of the fork, which is the wire going to the ignition coil (transformer). 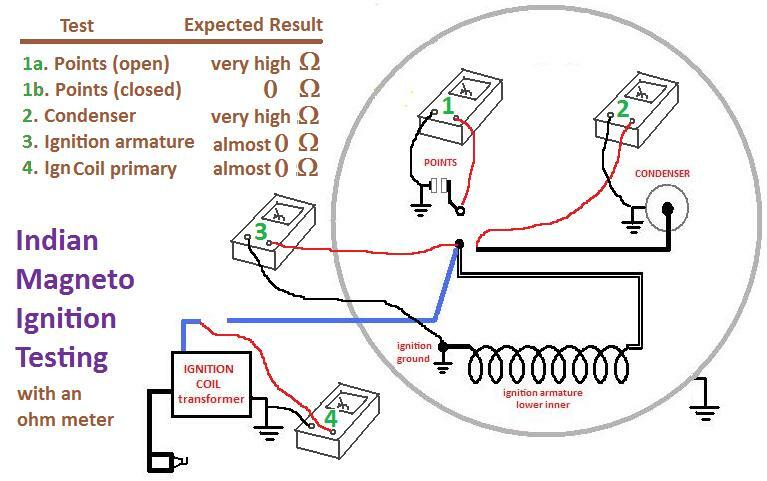 To static test each prong separately with an ohm meter or continuity tester, the wires detach at the points with eyelet connectors. See above for the exact same procedure. As a reminder, checking for spark is completely different and separate from checking the ignition components for continuity. Checking for spark is done with everything assembled and connected, with essential wires grounded, if any, and “kill” wires left disconnected. When a condenser is replaced, the lights coil is unbolted, and the new condenser wire is laid under it, to prevent it from rubbing against the rotating flywheel points cam. The thicker lights coil will pinch the condenser wire unless it is positioned in the corner before the coil bolts are tightened. Verify it and all other wires are not being pinched by tugging on them and feeling or seeing if they can move freely. 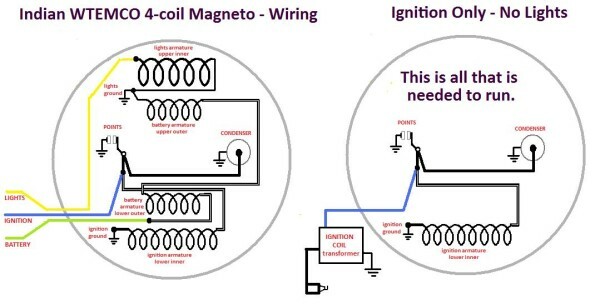 Indian WTEMCO 2-coil magneto is actually 3-coil because the lights coil and battery coil are one unit. The 90mm WTEMCO magneto is a Bosch compatible. Any 90mm Bosch magneto will bolt on and fit, both the 3-bolt stator plate and the flywheel. However, the ignition timing in the flywheel is different on the various Bosch flywheels. An Indian flywheel has the same timing angle as a Tomos. Both of those bikes can take a Puch flywheel, also 90mm Bosch, but it must be installed without the woodruff key, and positioned at the correct timing angle. It must be very tight, and can still slip later. Many of the modern CDI ignitions require that the woodruff key be left off, and the flywheel positioned at a particular angle on the crank. 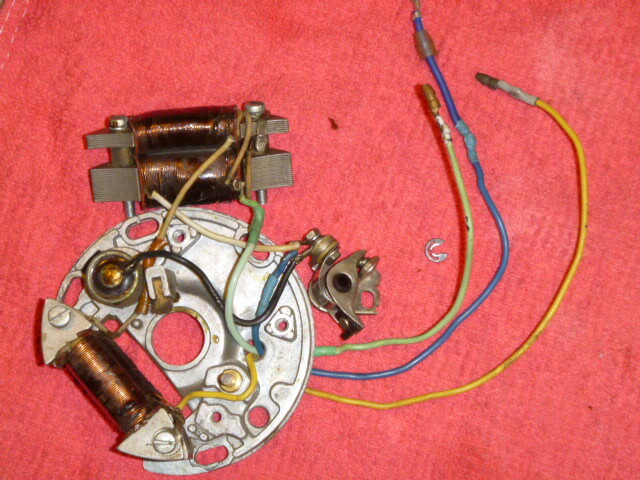 Such is the case if someone wanted to run a modern CDI ignition made for a Puch, on an Indian. Some more talk about this is in the Indian parts section. 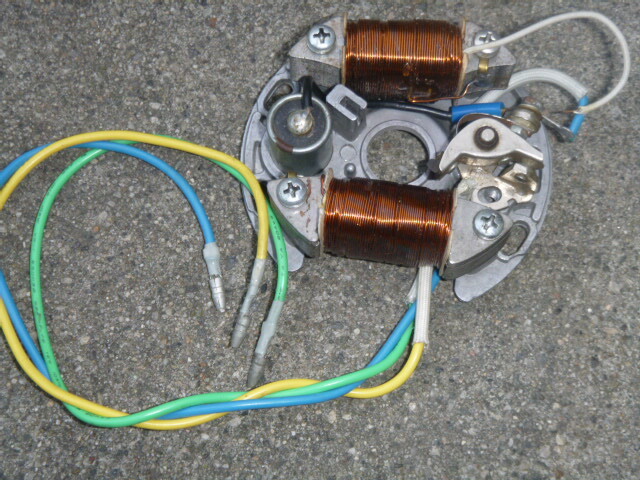 The stationary part of the magneto, the stator, can be substituted with any 90mm Bosch moped stator, such as a 6-wire Puch. As long as the Indian flywheel is kept the same, it will have the same ignition timing. 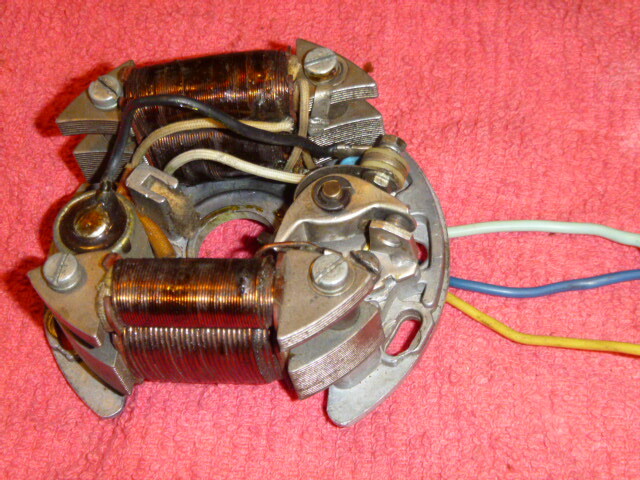 On a Puch 6-wire stator, 2 of the output wires are actually grounds (green/black = brake light ground, and blue/black = ignition ground). 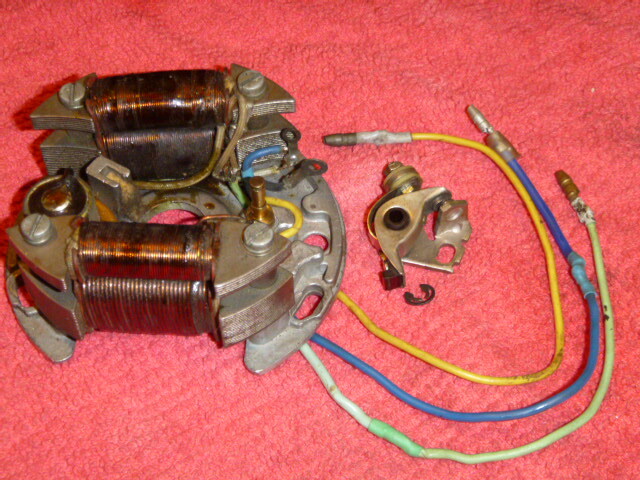 Once they are grounded, and the grey tail light wire is left unused, then a Puch 6-wire will directly substitute for Indian 3-wire, blue for blue, yellow for yellow, and green for green. 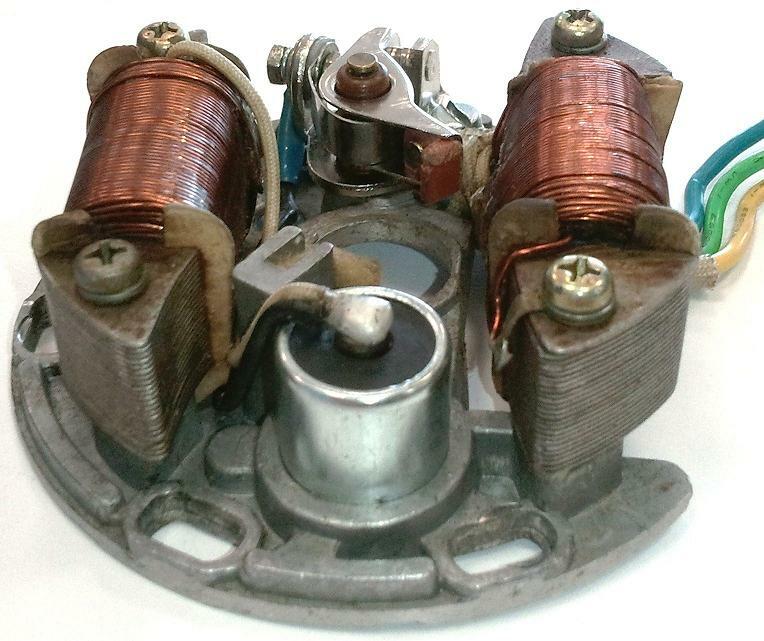 Knowing this should help many Indian owners that have very bad stators or none at all. The armatures on a Bosch stator (Puch) are 54mm hole spacing, both upper and lower mounts. The WTEMCO Indian ones are 52mm on the upper (lights) and 45mm on the lower (ignition). So Puch armatures don’t interchange with Indian ones. You are currently browsing the archives for the Indian Ignition Service category.